The Miami Hurricanes men’s basketball team beat the No. 10 Duke Blue Devils 55-50 at Watsco Center in Coral Gables, Fla. Saturday. The win was Miami’s fourth in a row and eighth in their last 10. On a grander scale, it secured the fifth 20-win season in Coach Jim Larrañaga’s six years as Miami’s skipper. The program had only six such seasons in the 31 years since the 1985 revival. Per usual, the energy was high inside the Watsco Center for Duke’s seasonal visit, and Miami players huddled in rah-rah fashion moments before tip-off. 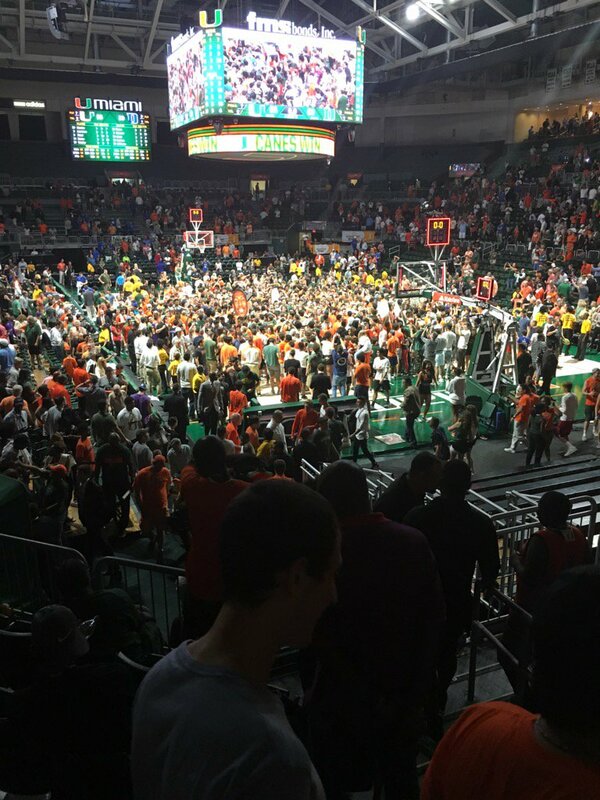 After the University of Miami basketball team defeated Duke, students rushed the court to celebrate with their student-athletes. Source: Twitter, @MarkRicht. Future NBA hall-of-famer Ray Allen, former Miami Heat star Chris Bosh, and MLB legend Alex Rodriguez were among the nearly 8,000 in attendance. Guard Ja’Quan Newton returned for the first time after a three-game suspension for violating team rules. Miami coach Jim Larrañaga sent out the same starting five (guards Bruce Brown, Anthony Lawrence, Jr. and Davon Reed; forward Kamari Murphy; and center Ebuka Izundu) for the fourth game in a row. 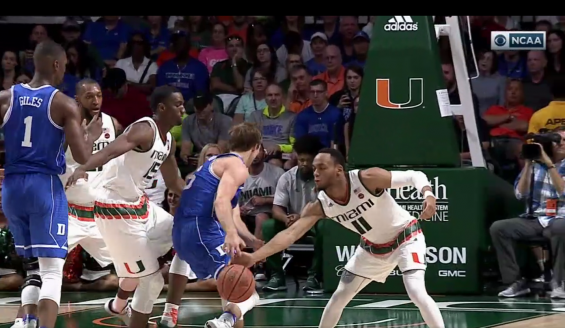 For every ‘Cane not named Bruce Brown, however, the offensive woes continued from Miami’s previous game against Virginia. That game, which went into overtime, saw Miami score a mere 54 points. Brown, the freshman guard from Boston, Ma. led the charge for Miami up to – and coming out of – the first media timeout. He started 3-3, scoring the ‘Canes first seven points on two strong dribble drives and a spot up three-pointer. A steal on Duke’s first possession by center Ebuka Izundu led to Brown’s transition layup on the other end. When play resumed, Brown showed up on the defensive side of things. He stole a pass from Duke’s Emile Jefferson that led to a Davon Reed slam and the first points scored by a ‘Cane other than Brown. Moments later, forward Kamari Murphy became the third ‘Cane to score when he slammed down a putback opportunity after a missed three by guard DJ Vasiljevic. Duke took the lead for the first time at 13-12 halfway into the first half. Brown was quick to give the ‘Canes the lead back when he put in a floater in the lane. At the first half buzzer, Brown and Murphy were the only Miami players to make at least two shots. Brown was 6-8 and the life-blood of the Miami offense, while Murphy’s two makes came on easy dunks. Vasiljevic, Izundu, and Anthony Lawrence, Jr., all went 0-3 in the first half. Reed was an ugly 1-7, and at times was making things harder on himself with poor shot selection. Defensively, the ‘Canes stifled Duke’s strong offense in the first half. Five steals (two by Reed) and a block (by Brown) limited the Blue Devils to 21 points. A steal by Lawrence, Jr. with four seconds until halftime turned into a Newton layup to give Miami a 22-21 halftime lead. Who else but Brown was there to score the first points of the second half for Miami. Brown penetrated like he had time again in the first half and converted an easy layup opportunity. Playing like his hair was on fire, Brown made plays all day. He picked the pocket of Duke’s Luke Kennard moments after his first basket of the second half and took it the rest of the way for an uncontested dunk. The play led to a Duke timeout as Miami came out of halftime with six straight points. The Miami crowd was at its loudest since tip-off almost five minutes into the second half. The uproar followed a steal by Brown and hard-fought basket on the other end by Reed, giving Miami its largest lead of the game at nine points. Izundu would stretch the lead to 10 after going 1-2 from the foul line. Freshman Dewan Huell finally got on the board for Miami with a putback dunk almost halfway through the second half. He has been playing fewer minutes the past several games as Coach Larrañaga has shortened his bench. Duke drew within five points at 37-32 before Lawrence, Jr. broke a Miami scoring drought with a pair of free throws with just over 10 to play. It took under two minutes of game-time thereafter for Duke to close the gap and tie the game. Back-to-back three-pointers brought the score to 39-38 Miami before Duke’s Jayson Tatum made a free throw. It was a back-and-forth contest the rest of the way. After Duke tied the game again at 43, Reed converted an and-one opportunity with just over four minutes to go. Murphy’s block of Kennard on the ensuing Duke possession led to an explosion from the crowd. The teams went scoreless for the next two minutes until Brown…again, who else?…went 2-2 from the free thrown line to put Miami up 50-45. A foul call against Newton on the defensive side resulted in the loudest barrage of collective boos in the game. Duke’s Harry Giles missed both attempts, however, to all but win it for the ‘Canes as Duke fouled the rest of the way. Duke finished the game missing eight of their last nine field goal attempts, an untimely drought that came in the last four minutes of play. After eight straight misses, Kennard finally scored for Duke on a three-pointer, bringing the score to 53-50 with only eight seconds left. Brown sealed the deal with a dunk just seconds later. Brown led all scorers with 25 points. He was the only ‘Cane to score in double-digits, and it doesn’t take much to imagine the outcome had he not been the torch-bearer. Reed was one point short of his first double-double on the season. He scored nine points for the second game in a row. Duke shot a paltry 31.8 percent from the field. They were held in check all day by Miami’s tenacious defensive effort. Miami finished the game with nine steals and five blocks. Defense wins championships, right? At least that’s how the saying goes. The ‘Canes limited their opponents to a mere 98 points over their last two games. Miami (20-8) plays the Virginia Tech Hokies (20-8) Monday at 9 p.m. in Blacksburg, Va. The game is broadcast nationally on ESPN2.